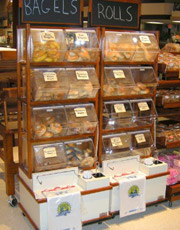 Complement your Bakery department with Bread Merchandisers featuring Acrylic Bins. GF-sensitive shoppers want to be certain that non-packaged baked goods are avoiding cross-contamination with gluten-containing like products. Acrylic bins provide this sense of security. 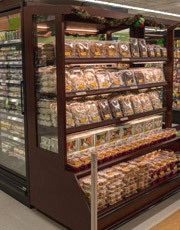 The use of Chalkboard Signs can also help direct the attention of shoppers looking for gluten-free options. Crate Merchandisers or Nesting Tables are not only attractive but great for spot merchandising. Place in your snack aisle and incorporate gluten-free snacks. Endcap Merchandisers at the end of an aisle can segregate GF products from other similar products within that aisle of the store — or can be used to integrate GF and non-GF products on separate shelves.